After going through many phases of information overload in from the sheer number of therapies available, these therapies no longer overwhelm me. Instead, I now have the opportunity to venture beyond my ten year comfort zone at The Bar Method, try new movement therapies, and find the right fit. In an ideal world, I would have a physiatrist to guide me in my exploration to find the optimal combination of movement therapy for my body. Will it be a mix of Yoga, Pilates, Gyrotonic, Feldenkrais, Tai Chi, or more? The path is uncertain and doing it on my own will require both determination and a spirit of experimentation, but, I am ready. Pilates vs Yoga vs Yoga Therapy – Aren’t They the Same? According to an article by Chopra Centered Lifestyle, Pilates focuses on strength, muscle toning, body control, and flexibility. Yoga focuses on flexibility and broad muscle groups, offering balance, endurance, strength, and spirituality. If you are a disciplined, structured workout kind of person, Pilates may be your drink. However, if you are more of a fluid, go-with-the-flow person, yoga is the way to go. As for yoga therapy vs. yoga, the American Viniyoga Institute says the intention behind taking a either option will distinguish between yoga class or yoga therapy session. Still, this is not a black and white choice, you may need a cocktail. Gyrotonic, derived from the words “circle” and “stretch,” combines dance, yoga, swimming, tai chi and gymnastics. It uses specialized equipment that helps one move with support and resistance. See what the Wall Street Journal has to say about Gyrotonic here. The method avoids machines, devices, and mechanical exercises. Instead, it uses touch and movement to form new connections between the brain and body. Because of this, Feldenkrais may also be considered part of a mind-body connection. Anat Banriel, practicing a subset of Feldenkrais, works off of the belief that the body can teach the brain. 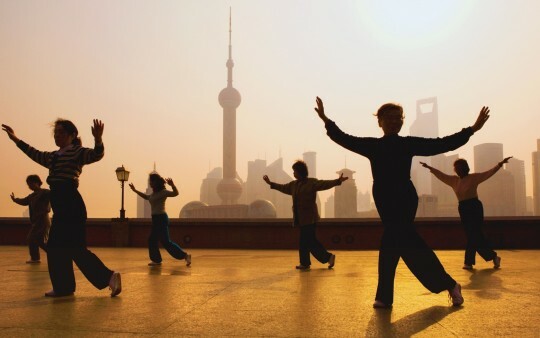 According to the Tai Chi Foundation, Tai Chi is based on the five elements of traditional Chinese medicine and supports lifelong balance and health. It provides specific movemnts and postures to aid in healing while offering energy, vitality, resilience, and flexibility. It is both powerful and gentle. For a brief look at how Tai Chi can help you, the National Institute of Health put together five tips on what you should know about Tai Chi for health. Look out 2016, I am embracing a DIY spirit of experimentation and will find the perfect mix of movement therapies this new year. What is your go-to technique for treating students and patients who have chronic pain and/or and autoimmune disease?